77-year-old Kim Li-tae said during an interview with the Choson Shinbo, a newspaper published by the General Association of Korean Residents in Japan, that he was one of the North Korean researchers who released nine trout into Tianchi Lake, located on Changbai Mountain, on July 30, 1960. At a later date they released other species of fish such as carp and mosquito fish into the lake. Generally fish cannot survive in a lake created by volcanic activity, but the Korean researchers have proven through experiments that fish can be transplanted live into the lake. Fish stocked by the researchers could survive by eating insects and other creatures blown to the lake by strong winds. The fish mutate during growth and form new varieties, so the trout they stocked might now be called "Tianchi trout," Kim said. In 2000, the Korean researchers did experimental tests on "Tianchi trout" found in shoal waters that measured 85 centimeters in length and weighed 7.7 kilos, but they've never been able to test trout from the deeper waters of Tianchi Lake. 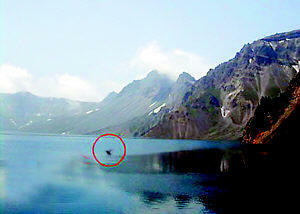 The "Tianchi monster" that Chinese photographer Zhuo Yongsheng, who works for a local TV station run by the administration office of the nature reserve at Mount Changbaishan, Jilin Province captured on film last month, might be a "Tianchi trout" from the deep of the lake, Kim said. Tianchi Lake is China's biggest and deepest volcanic lake, with an area of 9.8 square kilometers, and water surface 2,198 meters above sea level. The average water depth of the lake is 204 meters and the deepest spot is 373 meters. Earliest record of "monsters" date back over 150 years, but in the past decade the "monster" only appears in the summer.